Donald Trump again is causing international consternation. 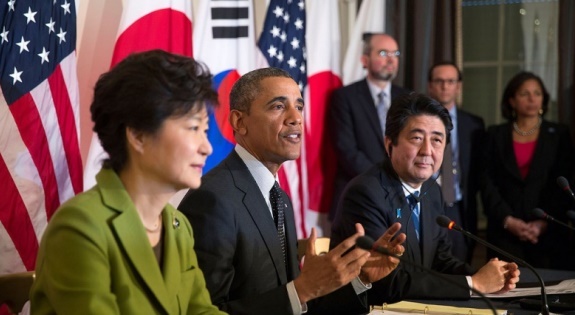 His remarks about South Korea and Japan developing nuclear weapons set off a minor firestorm. “It would be catastrophic were the United States to shift its position and indicate that we support somehow the proliferation of nuclear weapons to additional countries,” argued deputy national security adviser Ben Rhodes. Actually, what would be catastrophic is American involvement in a nuclear war as a result of its defense commitment to another nation, especially one able to defend itself. Indeed, Rhodes praised the fact that “Japan and the Republic of Korea benefit from our very rock-solid security assurances that we will come to their defense in any event.” But this has turned prosperous, populous countries into permanent defense dependents. Trump addressed this dependency. Neither country pays enough for its own protection, instead preferring to rely on Washington. He suggested that one answer would be for them to go nuclear. The issue “at some point is something that we have to talk about,” he explained. Despite the campaign to treat nuclear nonproliferation as sacrosanct, it cannot be decided in isolation. Broadly speaking, it is better if fewer nations have nukes. Yet in some cases proliferation might be stabilizing. Had Ukraine not given up its nuclear weapons left over from the collapse of the Soviet Union, Russia might not have grabbed Crimea and supported separatists elsewhere. Worse, the way Washington won assent of some nuclear-capable powers to abstain is to provide a “nuclear umbrella,” that is, promise to use nukes to defend them if necessary. As a result, the price of nonproliferation in East Asia is America’s willingness to risk Los Angeles to protect Seoul and Tokyo, and maybe Taipei and Canberra too. Today nonproliferation means only the bad guys get guns. In East Asia China, Russia, and North Korea are the nuclear powers. America is supposed to provide geopolitical balance. The result of this situation truly could be catastrophic. The question today is what approach is likely to most promote stability in Northeast Asia and least risk to U.S. security. So far, America’s defense promises have not caused the dragon or bear to lie down with the lamb. China is acting aggressively toward Japan, Philippines, and Vietnam in particular; Russia has challenged the U.S. in the eastern reaches of Europe and the Middle East. North Korea is worse, constantly breathing fire against its neighbors and the U.S. Still, policymakers act as if U.S. defense guarantees will never get called. The threat of nuclear retaliation undoubtedly has deterrent value. However, the two great wars of the 20th century started because deterrence failed. In particular, threats which seem inconsistent with underlying interests have little credibility. Thus, the Chinese have publicly doubted that America would risk nuclear war over Taiwan’s independence. Moreover, once given, it is hard to back away from “rock solid security assurances” which have lost their original purpose. Which means if deterrence fails America could be at war automatically without considering the stakes. Finally, promising to defend other, smaller powers allows them to hold American security hostage. With Washington behind them they are more likely to engage in risky behavior. During the 2000s Taiwan’s independence-minded Chen Shui-bian upset Chinese sensibilities. Japan has refused to even discuss the status of the Senkaku/Diaoyu Islands with China. Washington’s view that they are covered by the “mutual” defense treaty likely has encouraged Tokyo’s tough stance. Philippines has a military which might not be even second rate, yet that government is attempting to enlist the U.S. in its squabble with Beijing over Scarborough Reef. America’s nuclear umbrella is something we should debate, as Trump suggested. Yet Rhodes dismissed even discussing the idea, contending that “for the past 70 years” the U.S. has opposed nuclear proliferation. But when the world changes, policy also should change. Trump was right when he argued that “At some point, we cannot be the policeman of the world.” America’s nuclear umbrella deserves scrutiny. The greatest risk of catastrophe for this nation would be sleep-walking into an Asian nuclear war. Submitted by jon exner on Thu, 04/07/2016 - 12:24. We do not hear or use the term SEATO as we do NATO but I believe those who are attempting to dismantle both are putting the cart before the horse. They act like both were somehow created at the behest of the respective countries on both continents, like they asked for NATO and SEATO to be created so the United States of America to protect them. Just the opposite both were created after the 2nd world war to allow the U.S. military to have a foothold in of those respective continents to prohibit future wars from erupting which America would undoubtedly be drawn into as we were in the 1st and 2nd world wars. I would imagine that the United States of America forced it on the parties as part of the agreement to end the wars rather than the parties requested it of the U.S.A.
We made mistakes by allowing the Soviet Union to occupy the western European countries, The powers to be should have let Patton run the Russians back to the Soviet Union, but instead they wanted to be politically correct and did not, guess political correctness was around longer than we thought they just did not use that terminology. We have further made mistakes since the Korean war by mistakenly believing that we can fight a war of containment rather than forcing a win against the enemy. The lesson is truly only one, if you fight a war fight it to win not to contain it, understand that war is hell but the faster you bring the enemy to their knees the faster the war will end.